Andrea Kosto has a big job. She’s in charge of a 174-foot vessel that plies the waters of the Pacific Coast between Costa Rica and Panama. As the captain of the “Safari Voyager,” she holds the fate of up to 62 passengers in her hands. There are about 30 crew members who answer to her: the chief mate, skiff drivers, the hotel manager — even a massage therapist and a doctor. And she grew up in Peters Creek. The story of this Alaskan who chose to sail the sea started when she was very young. “My mom has a sappy story about when I was three years old,” she said. She paused to talk to passengers who visited her on the bridge during a stop on Costa Rica’s Osa Peninsula. “We were visiting Hawaii,” she continued. “And my mother said that I just looked out to the sea and at that moment I fell in love with the ocean,” she said. Kosto never really got over her first crush: the ocean. After graduating from Chugiak High School, she went on to study marine biology at University of Alaska Anchorage, which included coursework at University of Alaska Southeast and Hawaii Pacific University. During her summer breaks, she worked at a marine science explorer program with Kenai Fjords Tours in Seward. The program was designed to get elementary schoolkids out on the water to learn about the oceans, sealife and biology of the ecosystem. Crew members would drag a net alongside the boat and look at plankton under the microscope. 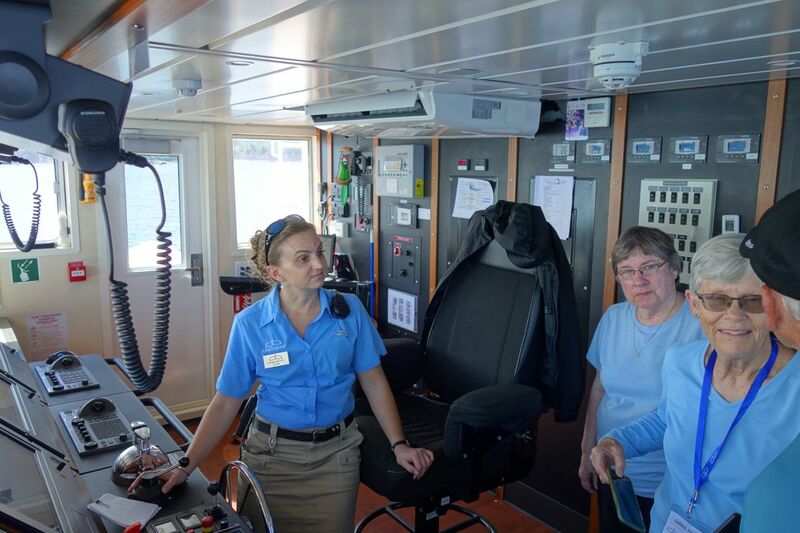 As she worked to share her love of the ocean with the kids in Anchorage and the Kenai Peninsula, Kosto set her sights higher for her own career, earning her 100-ton captain’s license at AVTEC in Seward. With her license in hand, she moved from the deck to the bridge, working on research vessels and cargo ships around the Pacific. After a two-year job with Lindblad Expeditions, she began studying for the series of exams necessary to get the next step: her 1,600-ton license. After working on small ships for Lindblad, Kosto resolved to no longer work on the mini-cruise ships. But a friend from Lindblad, who had taken a position with Uncruise Adventures, asked her to ferry a ship to Costa Rica. It seemed like a good fit — and she’s now been skippering the ship for two years. Uncruise is better-known for its small-ship itineraries in Southeast Alaska. With its fleet of nine ships, it operates a variety of itineraries starting in Juneau, Ketchikan or Petersburg. Based in Seattle, Uncruise itineraries concentrate on bays and fjords that are unavailable to the big boats. Uncruise also offers trips in Hawaii, Mexico’s Sea of Cortez and the Columbia and Snake Rivers. Because she now has a 1,600-ton license, Kosto is working the Costa Rica/Panama itinerary exclusively, even though she calls Alaska home. “My hope is that Uncruise may offer a program in Prince William Sound in the coming years,” she said. Even though it’s a long commute for her six-weeks-on-six-weeks-off schedule, Andrea loves the job. With Uncruise, instead of pulling up to a dock to get aboard, guests are loaded on to a couple of Zodiac inflatable boats. Throughout the cruise, guests go ashore in the Zodiacs and land on the beach. 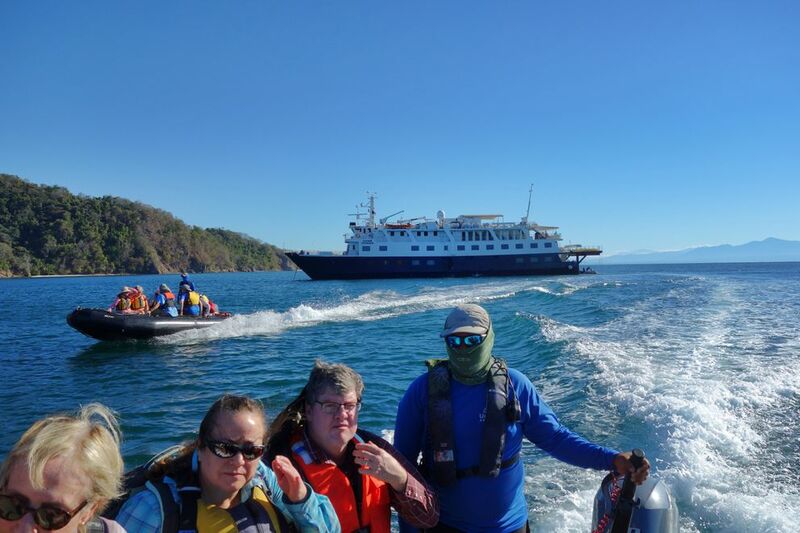 Similar to Alaska itineraries, the trips in Costa Rica are not limited by road access and Captain Kosto is able to guide the ship to the best places in the country’s extensive network of national parks. Kosto said she’s interested in pursuing more research in marine biology — and she’s coy about a particular emphasis. “I don’t want to narrow it down, because I’m curious about many aspects of ocean chemistry and traditional marine biology,” she said. It’s not a surprise that she still is considering post-graduate studies. After all, many of the onboard lecturers and guides have advanced degrees. Should she leave to pursue her goals, the ship still will be in good hands. Plus, there are two other young Alaskan women working as mariners on the ship.